This is the Kayaba Katsuodori, a tiny point-defence ramjet-powered interceptor. With the aid of four take-off rocket boosters it would get up to speed, ignite its ramjet and climb to meet hordes of allied bombers heading for Japanese cities. 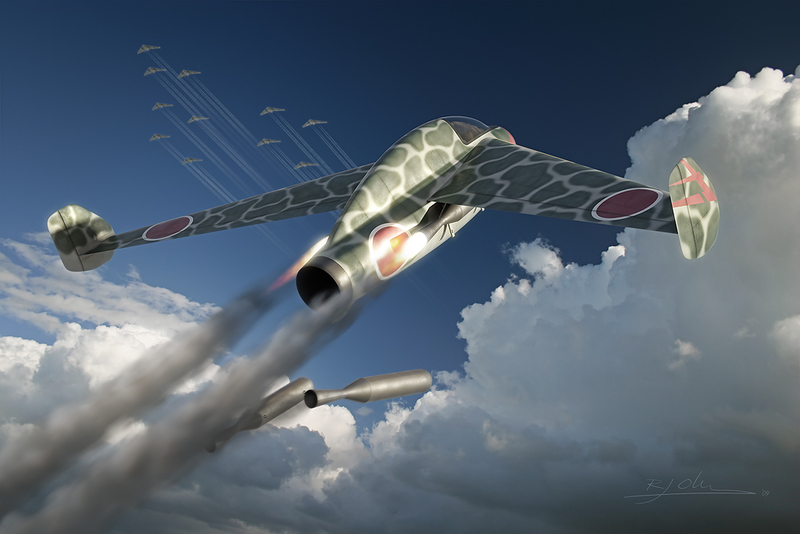 In concept the Katsuodori was pretty much alike the Messerschmitt Me 163 Komet, which was nicknamed the Kraftei (power egg). Alike the Komet, it was a tailless design and had a two-cannon armament, the cannon being crudely mounted underneath the wing roots. There was simply no space for armament in the fuselage and I had great trouble figuring out how to fit both a pilot and a ramjet air duct in that tiny nose of this plane. Like the Komet it was equipped with droppable landing gear and would land on a skid. But unlike the Komet it would probably not explode upon landing :lol: The ramjet didn't require the dangerous fuel cocktail used by the Komet's rocket motor. Flight endurance would likely have been better too. The aircraft in the illustration wears the markings of the 71st Sentai of the Imperial Japanese Army Air Force. In the distance is a typical Pacific theatre-style 11-aircraft box, consisting of B-35 flying wing bombers. Almost needless to say, the Katuodori never made it beyond a design proposal.